In the narrow sphere of Silver Tabby Shorthairs, three males and three females had particularly startling show careers. All were related. All were descended from the same foundation root stock, down from Mr. T. Sugden's 'King of the Fancy', born in the early 1880's. The first three stars in this firmanent, were Mrs. Herring's 'Champion Jimmy', a son of Mr. Sugden's 'King of the Fancy', and his close relatives, his full sister 'Champion Laurel Queen' owned by Mr. Charles Lane, and her son, 'Champion Laurel King'. Although 'Champion Laurel Queen' amassed two Gold and many Silver medals, plus thirty-five Specials and hundreds of First Prizes, 'Champion Jimmy' was overall the pre-eminent show cat, with Gold and Silver medals and Specials innumerable! But 'Champion Jimmy', who was born in 1890, was finally replaced and eclipsed in glory by his own son and namesake, 'Champion James II', born in 1901, owned by Mrs. Collingwood. 'James II' had unprecedented success on the show bench in his day, winning many championships, as well as multiple Best Shorthair Cat and Best Cat in Show awards. 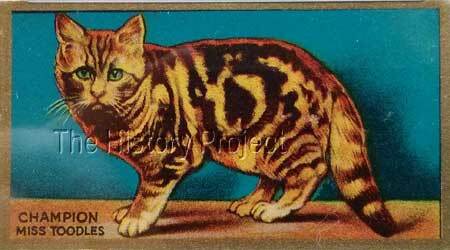 He was a highly respected show cat and sire, and it was his own daughter, in the form of 'Champion Toodles', who blazed into the limelight in 1903 as a kitten and then outstripped all-comers again as a young adult in 1904. Her successes were then unmatched until 1908 when, in the United States, another descendant of 'James II'. a female named 'Genesee Valley Jane', took all before her in a short but spectacular career on the show bench. Both 'Miss Toodles' and 'Genesee Valley Jane' were quite remarkable examples of their breed, and in all likelihood would be still be winners if their like were able to be shown in this day. What is singularly remarkable, in hind-sight, is that all of these great silver tabbies were descendants from one and the same family tree! 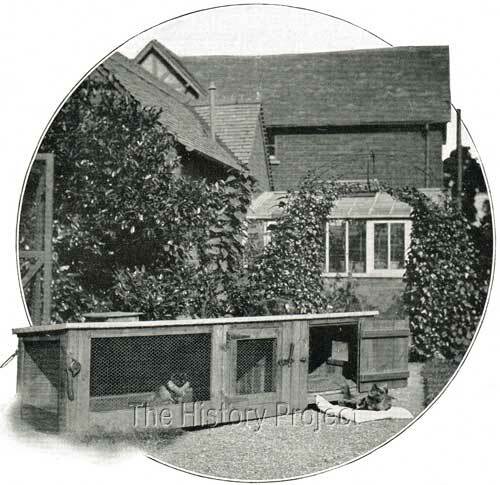 'Miss Toodles' was born on 1st July, 1903 at the Bossington Cattery of Mrs. Collingwood, of Leighton Buzzard. Her sire was Mrs. Collingwood's famous 'Champion James II' and her dam was 'Nanie'. From the beginning she was a notably superior specimen of the variety and her show career began early when, at the age of four months, she debuted at Cheltenham in November of 1903. Even as early as December of that year, Mrs. Collingwood was conscious of the fact that as an adult, there was potential for her to defeat her famous sire. "It is rare to find a lover of one kind of animal only. Those who have this taste inborn usually find room in their hearts for many, or, at least, several kinds. Mrs. Collingwood is an enthusiast in the hunting field, and the stables at Bossington contain about a dozen horses. "But we are more particularly concerned with the cats, and with the cat of all others, Ch. James II, the silver tabby short-hair, whose wins during a short show career constitute a record, and are recorded in full in another place in these pages. Jim is quite the pet of the establishment, and has the free run of the house. He appreciates the comfort of the kitchen fire, and always sleeps at the bottom of his mistress' bed. It is not at all extraordinary that Mrs. Collingwood, having this perfect silver tabby male in her possession, should have turned her attention seriously to the breed. She has procured one or two very good queens as his mates, and has met with the most conspicuous success in her breeding this season. "Toodles, whose portrait appears in our supplement, taken at four months old, made her debut at Cheltenham, and has since been shown at Brighton and Birmingham. On each occasion she has won highest honours in her class, and we are inclined to agree with her mistress, who thinks that, when full grown, she will beat her famous sire! 'Dame Fortune', Mrs. Bonny's noted winner, is an elder daughter of 'James II'. Mrs. Collingwood has undoubtedly got the best strain of short-hair silver tabbies in existence, and has proved that not only are they invincible in the show pen, but breed true to type. Another example of the Portable Cat Houses at Bossington. Only one full sibling is known, born more than two years after 'Miss Toodles'. Sire: Ch. James II	Dam: Nanie. Listed as bred and owned by Mrs. Collingwood. However, there are of course, many sire siblings, some of which are 'Miss Toodles' own progeny, including two sons, a daughter and a grand-daughter. 'Ch. 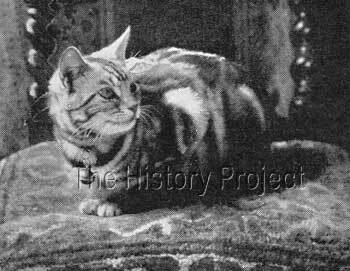 DAME FORTUNE', Silver Tabby Female, born: 1st March, 1902. Bred and Owned by Mrs. J. Mellor Bonny. An excellent show cat and breeder in her own right, 'Dame Fortune' produced many fine specimens in her variety, notable among whom were 'Dame Fortune II' by 'Sweet William', and 'Dame Fortune III', sired by 'Silvester'. 'Dame Fortune II', was exported to Mrs. J. Cathcart (USA) (ACA:501)(ACA v2), where she won many prizes at shows, becoming an American Champion. 'Dame Fortune III' was retained by Mrs. Mellor Bonny for breeding. Bred and owned by Mrs. Collingwood. 'O'Liza' was ultimately bred back to her sire to produce 'Bubbles' who was sold to Mrs. Roch. Bred by Mrs. Collingwood and owned by Mrs. Roch. The product of a father/daughter breeding, 'Sally' could claim to be from the two best silver tabby shorthairs known to be living at the time, 'Miss Toodles' being considered by many to be even better than her famous sire. Litter brother to 'Sally Ugly Mug', 'Flash Jim' was retained by Mrs. Collingwood. (OC: 29/July/1905). Litter brother to 'Sally Ugly Mug', 'Ja-Me' was also retained by Mrs. Collingwood. (OC: 29/July/1905). Bred by Mrs. Chivers and owned by Mrs. E. T. Moore. Well-known under his original name, but also listed under the name of 'Holmefield Silver Tabby Boy' as the sire of 'Silver Prince Fortunatus' (ACA:502) out of 'Dame Fortune II', (ACA:501). 'Silver Prince Fortunatus' was bred by Mrs. Bonny and exported to Miss J.Cathcart (USA). He was later sold to Lady Decies, when his name was then changed to 'Fulmer Tabby Boy' (NCC:5810) . Bred by Mrs. Thompson and owned by Mrs. Collingwood. Bred by Mrs. Collingwood. Owned by Miss J.R. Cathcart, New Jersey. 'Silver Stripes' went on to sire some exceptional kittens, among their number being the outstanding 'Genesee Valley Jane', whose dam was his niece, 'Dame Fortune II'. Bred by Mrs. Collingwood. Owned by Mrs. J.C. Mitchelson, Tariffville, Connecticut. 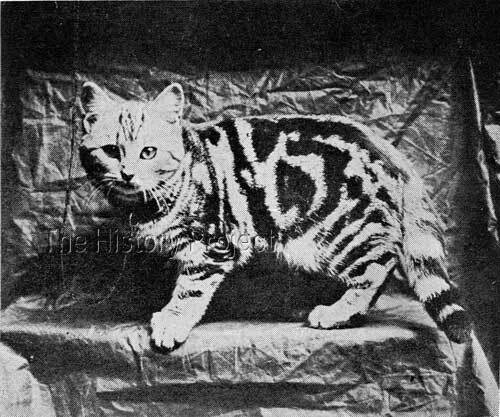 'The Buzzing Silver' was the most line-bred of all the cats sired by 'Ch. James II' being his daughter, grand-daughter,(as sire of 'Sally Ugly Mug') and great-grand-daughter,(as the sire of 'Miss Toodles'). 1st and Special for Best Shorthair Kitten, Cheltenham, 1903. 1st and Special for Best Shorthair Kitten, Brighton, 1903. 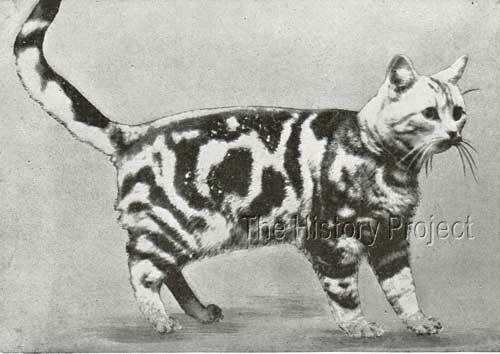 1st and Special for the Best Kitten in the Show, Birmingham, 1903. 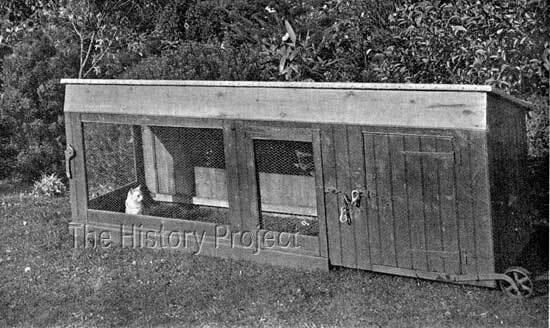 At the Sandy Show of 1904, 'Miss Toodles' was Best Short-haired Cat in Show, opposite 'Don Pedro of Thorpe' who was Best Long-haired Cat. "At Sandy on August 25th, Mrs. Herbert Ransome and Mr. Mason judged. Mrs. Balding being unfortunately unable to fulfil her engagement. Most of the best cats put in an appearance, and noted winners took most of the prizes. Two silver tabbies won as best long and short-hair respectively - Ch. Don Pedro of Thorpe and Ch. Miss Toodles"
"Silver Tabby - 1, Championship and Special for Best Short-hair, Mrs. Collingwood, Miss Toodles, who continues to improve steadily; she has an unusually neat shape and head for a short-hair, and her dense markings show up most beautifully on the pale silver ground. 2. Mrs. Bonny, Ch. Dame Fortune, sister to winner, another exquisite queen, if one may criticise, her markings are a trifle heavy on the back. " "Sheffield Championship Show, on November 17th, was a wonderful success for a first venture. Miss Simpson and Mr. T.B. Mason judged the Open, and Mrs. Tom Fletcher, the Local classes. Old winners scored in most of the classes. Ch. Zaida won as Best Long-hair and Ch. Miss Toodles as Best Cat in the show." "Birmingham Show had a capital entry, indeed a record one in blues. Ch. Don Pedro and Ch.Miss Toodles repeated their wins as best in their respective sections. More than one noted winner fell from their high estate on this occasion. The judges were Lady Marcus Beresford, Mr. Mason and Mr. Ambrose." Only one litter of record can be found for 'Miss Toodles'. 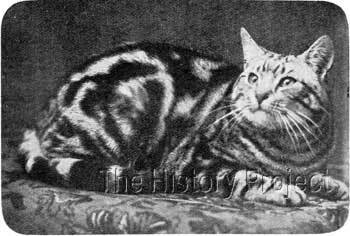 In that instance, she was bred back to her sire and in a litter born 20th April, 1905, she produced three Silver Tabbies, two males and one female. The males were 'Flash Jim' and 'Ja-Me' respectively. The female was 'Sally Ugly Mug' which from her name may suggest that she was not considered to be of sufficient merit in the head, to be a show specimen. This is somewhat surprising considering her breeding, as she could boast the best possible pedigree and her parentage was the best that could be had, for her variety. Her dam, 'Toodles' had what was considered to be a near perfect head. Never-the-less, there are no show records to be found for 'Sally Ugly Mug'. She was, however, used for breeding, and in an unusual move, this double daughter of 'James II' was put back to her sire/grandsire in a direct tripling on 'James'. The result was another female, 'The Buzzing Silver', who was exported to the United States, to Mrs. J. C. Mitchelson. 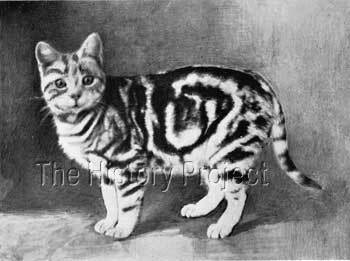 No doubt Mrs. Mitchelson was keen to obtain such a line-bred (and inbred) cat based upon the most successful Silver Tabby Short-hair male to date! 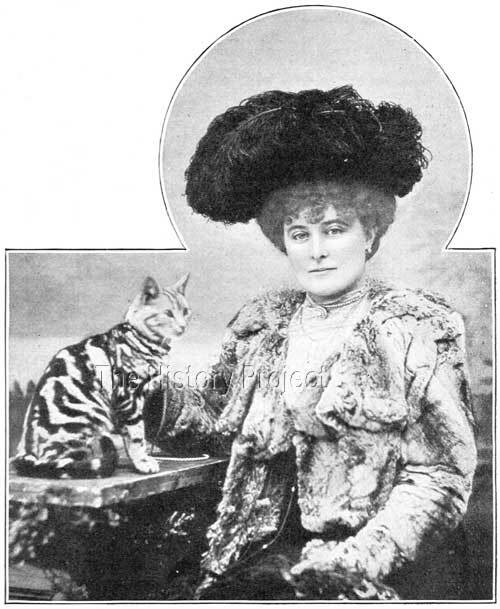 'Miss Toodles', after her Best Short-hair Cat in Show win at 'Sandy' in 1904. Mrs. Collingwood's 'Miss Toodles', a winner at The Crystal Palace Show. Note, that similarly to their card featuring the Silver Tabby Longhair, 'Ch. Don Pedro of Thorpe', 'Miss Toodles' is also misrepresented as a Brown Tabby. But at least in this case, they managed to spell her name correctly! The rise of 'Miss Toodles' was immediate and meteoric. In her only three shows as a kitten, she was Best Shorthair Kitten, three times. A more purr-fect result could not have been expected. As an adult, she blazed a similar trail gaining Best Shorthair Cat and even Best Cat in Show over the Longhairs. These exceptional wins followed on the tail of a long list of great wins by her sire, firmly setting Mrs. Collingwood's fame in short-haired silver Tabbies. When taking a closer look at the decisions made by Mrs. Collingwood in her breeding program, we cannot but admire her tenacity and her wisdom. 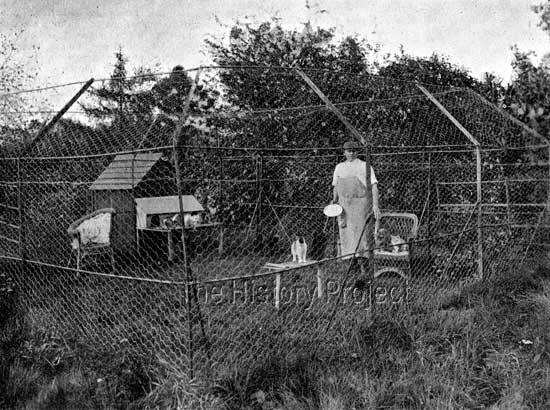 Her cats were given as much freedom as possible, without prejudicing their safety or the long-term goals of her breeding plans. They were pets first, and show cats second. She was careful to keep back-up males and females, selling only those kittens that she could afford to let go, to insure there was always a future in her own cattery. She was ultimately convinced to share her studs' lines with others, which she did, and she personally contributed to the gene pool internationally with her exports. There are lessons to be learned from this. How often have you seen exceptional lines lost, simply because the breeder concerned would not let out or share their championship bloodlines? What benefit is this to the breed? What does that breeder achieve in the long term, but to prove that they knew how to select and produce show winners, and to take them to success on the show bench? Where is the heritage that they have passed on to succeeding generations? The win will always pass, and 'all is vanity'. The answer is - love your cats, do all that you can to preserve the best lines, but share them with other responsible breeders who will do the same. Ultimately, the only contribution worth making is the one which adds value to the future potential of your breed. It most certainly does not lie in the accolades collected on the way!